The Musto Keepers Jacket is making a comeback for the 2012/13 season, much to the delight of many of us in the industry. 3 years ago Musto decided to drop it from the range, superseding it with the Woodlands Jacket. Whilst the Woodlands was a good Jacket, it was just never quite the Keepers. After it was dropped I quickly lost track of how many times I was asked by someone for a Keepers Jacket, generally on the recommendation of a mate who had one, or because they lost theirs and had been so pleased with it they wanted exactly the same again. The new version of the Keepers Jacket retains the majority of the features of the original jacket. It is designed as the ultimate jacket for the practical shooter who wears it hard, for keepers and rough shooters who are out and about amongst the bramble and gorse, but still want a respectable looking jacket for a day’s driven game shooting. And most importantly at a price that is sensible, unlike some of the other shooting jackets on the market, particularly those featuring a GORE-TEX® membrane, the Keepers always was, and will again be at a very sensible price. If there was a criticism of the original jacket it would be the weight. To fit the brief of being incredibly durable the outer fabric had to be heavy. In its first version about 12 years ago the coat really was very heavy, which put a few people off. A later version rectified this a bit, but it was still heavy, however in the couple of years it has been away fabric technology has continued to move on, and the new version is much lighter, meaning you don’t feel like you’re dragging it around all day, but you still have a coat that is durable under the toughest of shooting conditions. I for one am delighted to see it back! 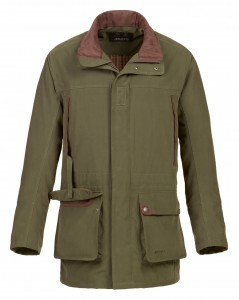 Musto Keepers Jacket, Musto Shooting Jacket. Bookmark.